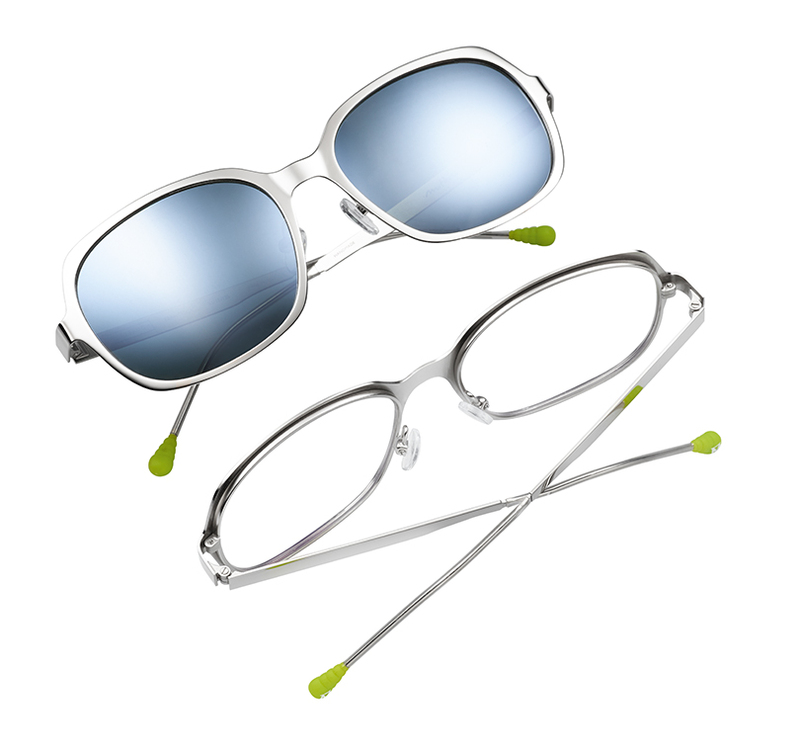 The De-Volution of Eyewear?Far from it! Sometimes an eyewear collabo just fits like a hand in glove. Case in point: The new eyewear collection co-designed by Shane Baum and Mark Mothersbaugh brings together two creative heavyweights of their respective genres. Mothersbaugh is revered for trailblazing a new direction in pop culture as singer, songwriter, composer, and front man of influential New Wave band DEVO. With his eponymous label, MOTHERSBAUGH, he is now creating a unique selection of eyewear, bringing on board Shane Baum, the creative mastermind behind Baumvision and designer for some of the most haute labels in the eyewear business, including his very own brand Leisure Society. For this issue’s Designer Interview, EYEWEAR gets the inside scoop behind this meeting of the minds. An important piece of conventional wisdom maintains: “Never meet your idols.” Ultimately, real life will only disappoint, shattering the glittering aura surrounding the heroes of our rebellious youth. And that’s especially true in the music business. But what happens when the artist who wrote the soundtrack to your teenage wanderlust suddenly reaches out to co-design an exclusive eyewear collection? That’s exactly what recently happened to Shane Baum, the California-based designer who has been turning heads in the eyewear business since starting his own premium label Leisure Society in 2010. In the summer of 2014, Shane Baum received a request from no other than Mark Mothersbaugh, the musical trailblazer behind progressive New Wave band DEVO. The musician was in the middle of building his own brand, MOTHERSBAUGH, to create products according to his own artistic vision, starting things off with a line of eyewear. Was that something Shane could be interested in, perhaps? Baum did not have to think twice. “I’ve been a fan of Mark’s music career since I was 12 years old and was a member of the DEVO fan club,” said Shane Baum. And as it turned out, the musician had, in turn, also developed an interest in optical craftsmanship at quite a young age. From necessity, mostly. Mothersbaugh was born with extreme myopia and astigmatism. For the first seven years of his life, he would constantly bump into walls and objects, until a proper eye exam revealed that he was legally blind. “I got my first pair of glasses for my eighth birthday, and saw birds flying, the tops of trees, even clouds for the first time in my life,” said Mothersbaugh. “It was amazing! I had never seen chimney smoke or the roof of a house and I immediately started drawing everything I saw,” said Mark Mothersbaugh. Thanks to his newly found vision, he immediately decided to become an artist – his paintings have been featured at numerous museums, including the Museum of Contemporary Art in Denver – and also penned numerous designs for custom-made glasses over the years. For many years, Los Angeles brand l.a. Eyeworks produced glasses according to Mothersbaugh’s specific requirements. These creative forays into eyewear design formed the perfect foundation for getting the ball rolling on a collaborative effort, said Shane Baum. “Mark, being legally blind, intuitively creative, and a fan of eyewear in general was simply excited to make his own eyewear. For me, well, it’s my profession,” smiled Shane Baum, who cut his teeth as a designer at Optical Shop in Aspen under the tutelage of Bill Barton. Asked what exactly he appreciates the most about Mothersbaugh’s creative work, Shane said: “I admire Mark’s work ethic and his continual mantra to think ‘outside of the box.’ He has no interest in commercial schemes and is a true ‘artists’ artist.’ His body of work is intrinsically original and without peer.” Next to DEVO, the enormously prolific artist has released three solo albums and composed the soundtracks to various marquee feature films, including the full score for several Wes Anderson tales (Rushmore, The Royal Tenenbaums, and The Life Aquatic with Steve Zissou), as well 2014’s The Lego Movie. 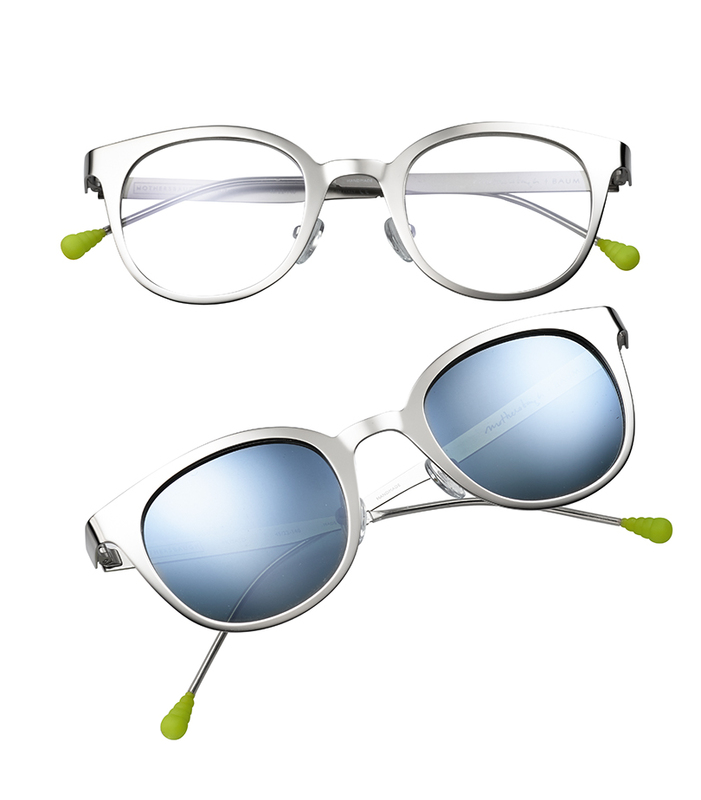 The exclusive Mothersbaugh X Baum Eyewear Collection consists of three models – each available in an RX and sunglasses version – and was launched in November 2014 in Los Angeles. Sounds easy, but turned out quite challenging; what with all the visionary ideas floating around. Here are some of the milestones of getting this unique – and somewhat futuristic looking – line of eyewear off the proverbial ground. Without briefly touching upon the cultural significance and revolutionary influence of the band, or better yet, the phenomenon known as DEVO, any further discussion would be out of place. Those already familiar with DEVO are welcome to skip this segment, but here’s what needs to be said at this point: Without DEVO, the musical chain reaction between New Wave, Art Rock, all the way into Punk Rock in the U.S. would have taken a radically different course. Devo was founded in 1972 by art students Mark Mothersbaugh, Jerry Casale (bass), and Bob Lewis (guitar) at Kent State University in Ohio. The name of the band is derived from the theory of the “de-evolution” of mankind – highly popular in avant-garde circles at the time – for which the band members found proof in events like the murder of unarmed anti-war protesters by National Guard troops at their university in 1970. Concerts of the “De-Evolution Band” blended subversive lyrics and futuristic costumes such as bright-yellow jumpsuits paired with pyramid-shaped plastic hats into avant-garde happenings; an explosive blend of performance art with dark visions of the future that appealed to geeks and nerds and frustrated youths across all social strata. DEVO quickly built a massive following among members of the counter culture movement, as well as surfers and skateboarders, as the sound of the band oscillated between New Wave and Punk, and later Synthpop. The 1980 DEVO music video for the song “Freedom of Choice” features skateboard icons such as Stacy Peralta and Tony Alva accompanied by lyrics cynically condemning the consumer craze of Reagan era America. Act of fate, or mere coincidence? Any way you slice it, the meeting between Baum and Mothersbaugh proved somewhat inevitable in the cultural hotbed of Los Angeles, where the realms of art, music, and the entertainment industry intersect frequently. “We met through a mutual friend that was producing a children’s show called Yo Gabba Gabba,” said Shane Baum. On the show, Mothersbaugh appears as an artist teaching kids how to paint at the studio – very close to real life, if you will. Straight out the gate, creative sparks started flying across the room when Baum and Mothersbaugh exchanged ideas. “Our first meeting was fast and furious with many ideas and concepts,” Shane Baum remembers. As part of DEVO’s stage show, Mothersbaugh had already designed a number of curious, art-inspired pieces of eyewear with band mate Jerry Casale. 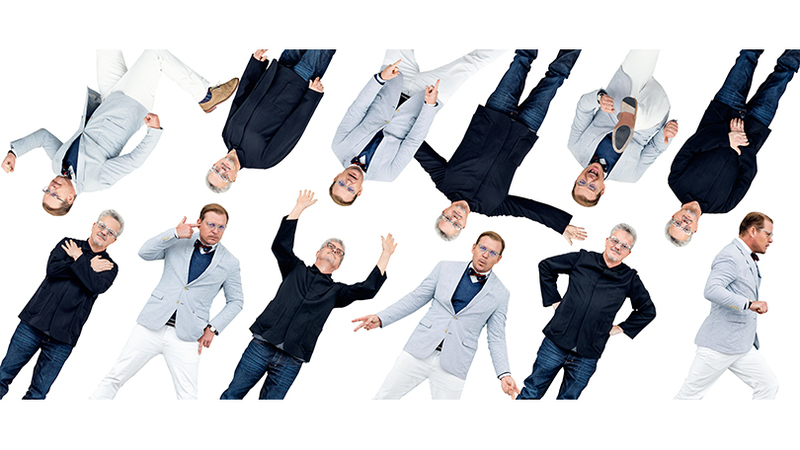 Now that his own brand under his own name and according to his own vision was taking shape, Mothersbaugh wanted to kick things up a few notches, which early on took the scope of ideation well beyond the mere product level. 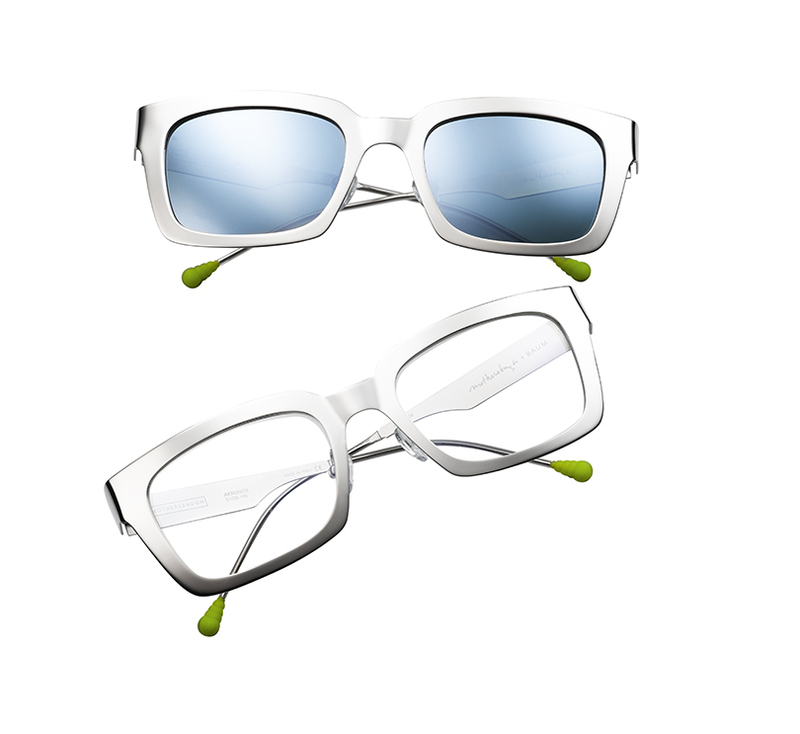 A material gleaming with a characteristic surface structure, Beryllium is a rare material choice in the eyewear segment. But as the lightest weight metal of the alkaline earth metals group, Beryllium is six times stronger than steel and resistant to tarnish and corrosion. Complementing the futuristic overall look, mirrored CR39-lenses provide 100% UVA and UVB protection, and are resistant to most chemicals and extremely durable – because anyone listening to DEVO knows, the future can be bleak. Akronite – Designed as Mothersbaugh’s personal frame, the Akronite features rectangular lenses in a shape reminiscent of classic wayfarer models. The name pays tribute to Mark’s birthplace; the town of Akron, Ohio. Mutato – This thinner frame owes its name to a made-up word combination: “Mutant” blended with “Potato” is the name of Mark’s production company, inspired by DEVO’s lyrical attempts to describe the social pecking order of life, in which they ranged as “spuds” or “potatoes”. But powered by mutation, they take on super-human qualities, all the way to rocking bookish, more scholarly looking frames like these. Francesca – This unisex frame with rectangular lenses literally covers both genders. The Francesca is named after the Mothersbaugh family dog, is an official “card carrying” hermaphrodite pooch, as confirmed by its veterinarian. As the precious pooch is both male and female, these frames can go “either way” as the ultimate unisex style.